Herpes is something that is incredibly common while managing to be taboo at the same time. While there isn’t a cure for herpes, there are treatments available that help you deal with the symptoms of an outbreak, such as the lemon balm herpes remedy. Herpes sufferers have reported remarkable improvement within a matter of minutes to hours after using a lemon balm herpes remedy topically as well as internally. Please note that we are compiling these remedies for general informational purposes, what works for one person will not work for all people, and you should consult with your doctor or other healthcare provider before embarking on any course of treatment. Lemon balm, also known as Melissa Officinalis, is sometimes used as an alternative, herbal treatment for herpes. Lemon balm consists of a number of different antiviral ingredients such as flavonoids. It’s said to have properties that reduce stress, a common cause of cold sores and outbreaks. 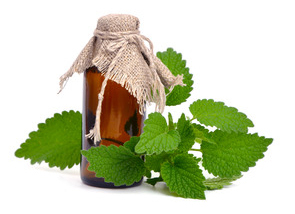 Lemon balm quickly treats mild cases of herpes. For example, it can cut down the time you end up dealing with cold sores by nearly 50%. What are Lemon Balm’s Benefits? There are a number of ways you can garner the benefits of lemon balm when it comes to treating herpes. Lemon balm, a member of the mint family, and its extracts and oils contain tannins, known for their potent antiviral properties. In addition, this powerful herb is rich in eugenol, a robust anti-bacterial chemical noted for its ability to relax the muscles and nerves, and terpenes which soothes painful nerve issues and is often used in aromatherapy as well. How is Lemon Balm used for Herpes? One of the most effective ways to apply lemon balm is by soaking a cotton ball with lemon balm extract and dabbing it on any signs of a herpes outbreak. Lemon balm tea can be used to wash sores or rashes as well. Lemon balm can also be taken internally as a tincture, in tea, or in pill form (like these lemon balm softgels). Adding a bit of lemon balm to water everyday may even cut back on the amount of times you have a herpes outbreak. There are also topical ointments or cream treatments available over the counter that have been said to ease the pain of herpes sores, and like the options mentioned above can shorten the amount of time you suffer from the infected areas. Lemon balm has a reputation for fighting off a variety of viral infections including all herpes conditions, and it also a remarkably safe option. As a matter of fact, the University of Maryland has reported that lemon balm hasn’t been shown to cause any symptoms of toxicity or side effects. Even so, it’s always a good idea to be cautious if you have any medical conditions, are pregnant or nursing. Consult your doctor or other healthcare practitioner before embarking on any natural treatment options. With that said, the lemon balm herpes remedy could prove useful for you.